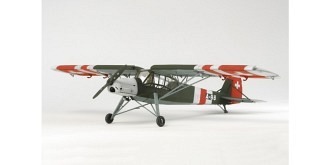 The Fieseler Fi156 Storch was one of the Germany's representative aircraft during WWII. It had a lightweight construction made up with a cloth-covered steel pipe airframe and wooden wings. Capable with excellent STOL (Short Take-Off and Landing) performance, it was used for various duties such as liaison, spotting, and reconnaissance. The Fi156 was also used by a number of other countries such as Switzerland, Italy, and Hungary and some aircraft were used even after the war ended. The Tamiya 1/48 scale plastic model assembly kit faithfully reproduces this iconic airplane with high attention to detail.